Power produces thrust which, with the appropriate angle of attack of the wing, overcomes the forces of gravity, drag, and inertia to determine airplane performance. Power control must be related to its effect on altitude and airspeed, since any change in power setting results in a change in the airspeed or the altitude of the airplane. At any given airspeed, the power setting determines whether the airplane is in level flight, in a climb, or in a descent. If the power is increased in straight-and-level flight and the airspeed held constant, the airplane climbs; if power is decreased while the airspeed is held constant, the airplane descends. On the other hand, if altitude is held constant, the power applied determines the airspeed. Figure 7-55. An aircraft decreasing in airspeed while gaining altitude. In this case, the pilot has decreased pitch. Figure 7-56. Figure shows both an increase in speed and altitude where pitch adjustment alone is insufficient. In this situation, a reduction of power is also necessary. For changes in airspeed in straight-and-level flight, pitch, bank, and power must be coordinated in order to maintain constant altitude and heading. When power is changed to vary airspeed in straight-and-level flight, a single-engine, propeller-driven airplane tends to change attitude around all axes of movement. Therefore, to maintain constant altitude and heading, apply various control pressures in proportion to the change in power. 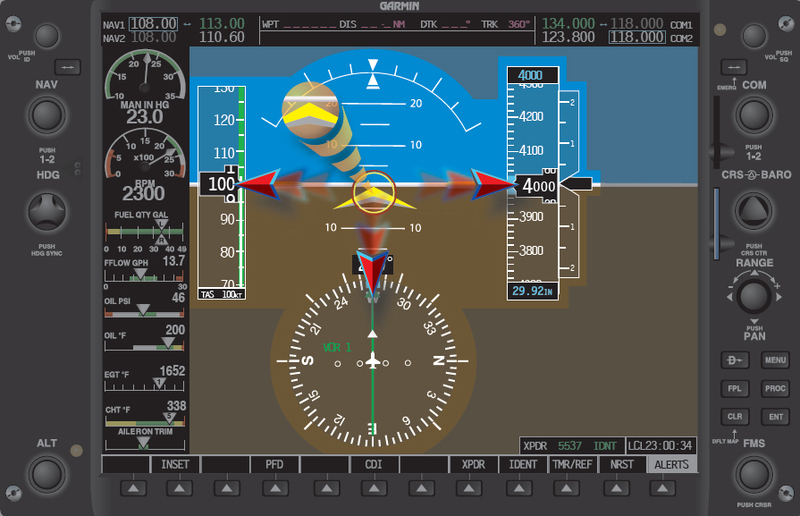 When power is added to increase airspeed, the pitch instruments indicate a climb unless forward-elevator control pressure is applied as the airspeed changes. With an increase in power, the airplane tends to yaw and roll to the left unless counteracting aileron and rudder pressures are applied. Keeping ahead of these changes requires increasing cross-check speed, which varies with the type of airplane and its torque characteristics, the extent of power and speed change involved. Consider the example of an airplane that requires 23 inches of mercury (“Hg) to maintain a normal cruising airspeed of 120 knots, and 18 “Hg to maintain an airspeed of 100 knots. The reduction in airspeed from 120 knots to 100 knots while maintaining straight-and-level flight is discussed below and illustrated in Figures 7-57, 7-58, and 7-59. Supporting pitch and bank instruments are shown in Figure 7-57. Note that the supporting power instrument is the manifold pressure gauge (or tachometer if the propeller is fixed pitch). However, when a smooth power reduction to approximately 15 “Hg (underpower) is made, the manifold pressure gauge becomes the primary power instrument. 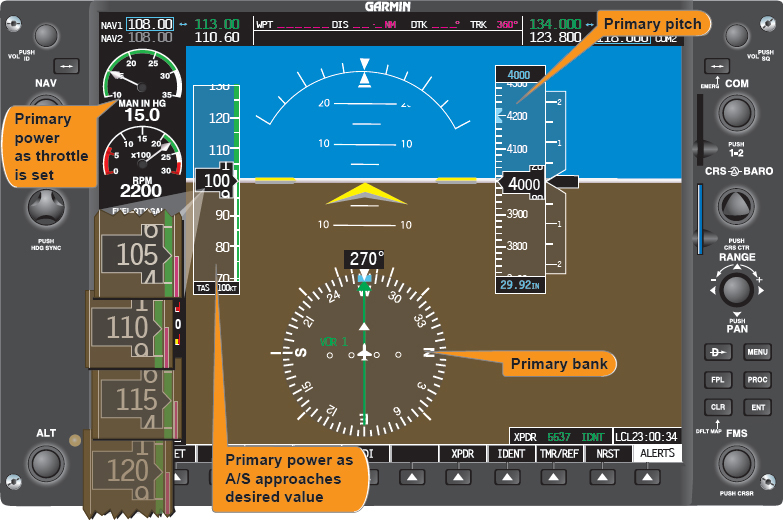 [Figure 7-58] With practice, power setting can be changed with only a brief glance at the power instrument, by sensing the movement of the throttle, the change in sound, and the changes in the feel of control pressures. 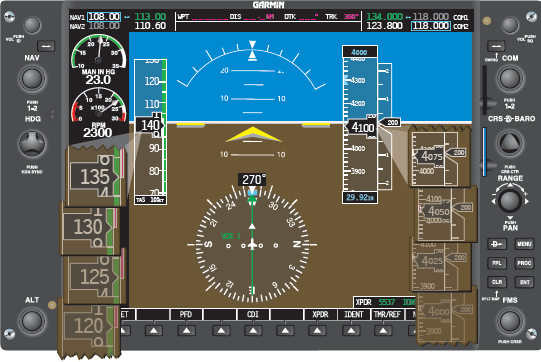 As the thrust decreases, increase the speed of the cross-check and be ready to apply left rudder, back-elevator, and aileron control pressure the instant the pitch and bank instruments show a deviation from altitude and heading. As proficiency is obtained, a pilot will learn to cross-check, interpret, and control the changes with no deviation of heading and altitude. Assuming smooth air and ideal control technique, as airspeed decreases, a proportionate increase in airplane pitch attitude is required to maintain altitude. Similarly, effective torque control means counteracting yaw with rudder pressure. Practice of airspeed changes in straight-and-level flight provides an excellent means of developing increased proficiency in all three basic instrument skills and brings out some common errors to be expected during training in straight-and-level flight. Having learned to control the airplane in a clean configuration (minimum drag conditions), increase proficiency in cross-check and control by practicing speed changes while extending or retracting the flaps and landing gear. 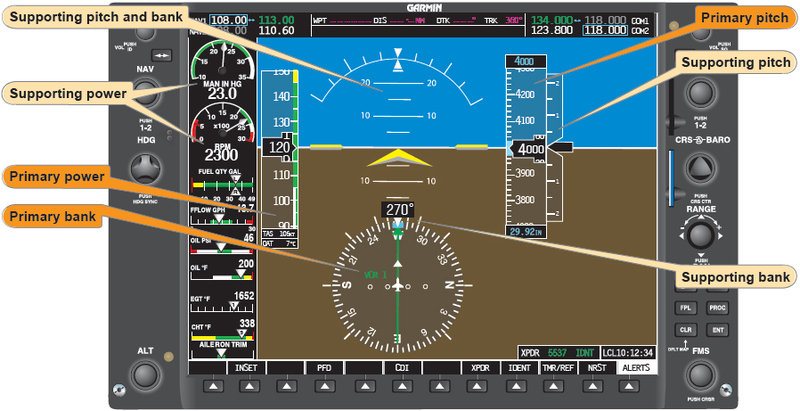 While practicing, be sure to comply with the airspeed limitations specified in the POH/AFM for gear and flap operation. Sudden and exaggerated attitude changes may be necessary in order to maintain straight-and-level flight as the landing gear is extended and the flaps are lowered in some airplanes. The nose tends to pitch down with gear extension, and when flaps are lowered, lift increases momentarily (at partial flap settings) followed by a marked increase in drag as the flaps near maximum extension. Maintain rpm at 2,500, since a high power setting is used in full drag configuration. Reduce manifold pressure to 10 “Hg. As the airspeed decreases, increase cross-check speed. Make trim adjustments for an increased angle of attack and decrease in torque. Lower the gear at 115 knots. The nose may tend to pitch down and the rate of deceleration increases. Increase pitch attitude to maintain constant altitude and trim off some of the back-elevator pressures. If full flaps are lowered at 105 knots, cross-check, interpretation, and control must be very rapid. A simpler technique is to stabilize attitude with gear down before lowering the flaps. Since 18 “Hg manifold pressure holds level flight at 100 knots with the gear down, increase power smoothly to that setting as the ASI shows approximately 105 knots, and retrim. The attitude indicator now shows approximately two-and-a-half bar width nose-high in straight-and-level flight. Actuate the flap control and simultaneously increase power to the predetermined setting (25 “Hg) for the desired airspeed, and trim off the pressures necessary to hold constant altitude and heading. The attitude indicator now shows a bar width nose-low in straightand- level flight at 95 knots. Trim control is one of the most important flight habits to cultivate. 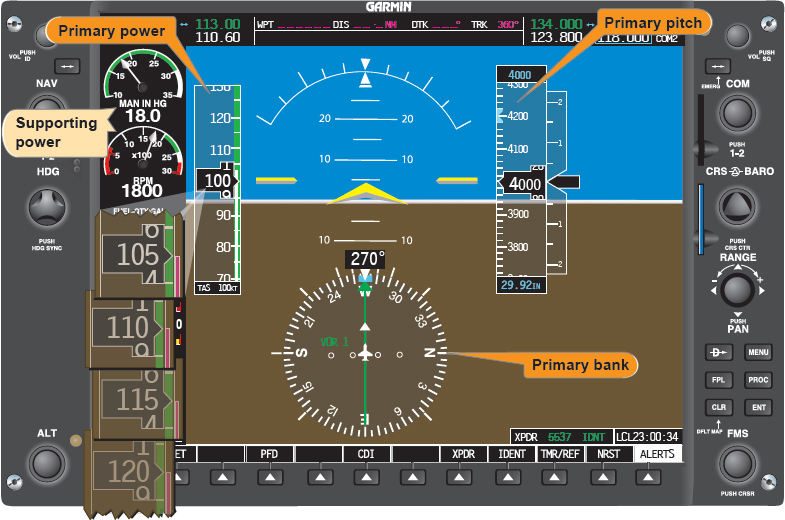 Trimming refers to relieving any control pressures that need to be applied by the pilot to the control surfaces to maintain a desired flight attitude. The desired result is for the pilot to be able to take his or her hands off the control surfaces and have the aircraft remain in the current attitude. Once the aircraft is trimmed for hands-off flight, the pilot is able to devote more time to monitoring the flight instruments and other aircraft systems. In order to trim the aircraft, apply pressure to the control surface that needs trimming and roll the trim wheel in the direction pressure is being held. Relax the pressure that is being applied to the control surface and monitor the primary instrument for that attitude. If the desired performance is achieved, fly hands off. If additional trimming is required, redo the trimming steps. An aircraft is trimmed for a specific airspeed, not pitch attitude or altitude. Any time an aircraft changes airspeed, there is a need to re-trim. For example, an aircraft is flying at 100 knots straight-and-level. An increase of 50 rpm causes the airspeed to increase. As the airspeed increases, additional lift is generated and the aircraft climbs. Once the additional thrust has stabilized at some higher altitude, the airspeed will again stabilize at 100 knots. This demonstrates how trim is associated with airspeed and not altitude. If the initial altitude is to be maintained, forward pressure would need to be applied to the control wheel while the trim wheel needs to be rolled forward to eliminate any control pressures. Rolling forward on the trim wheel is equal to increasing for a trimmed airspeed. Any time the airspeed is changed, re-trimming is required. Trimming can be accomplished during any transitional period; however, prior to final trimming, the airspeed must be held constant. 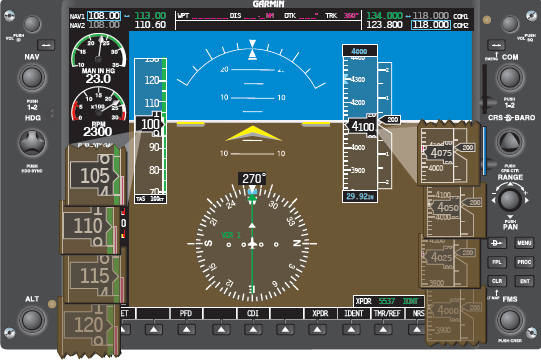 If the airspeed is allowed to change, the trim is not adjusted properly and the altitude varies until the airspeed for which the aircraft is trimmed is achieved.